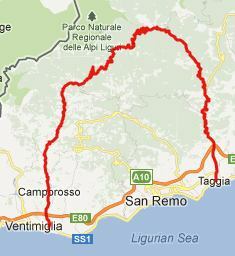 There is no higher paved pass, closer to the mediterranean coast around the San Remo area, and it is a very popular ride. The major attraction are the hilltowns along the way. The summit is of little scenic interest, except as jumping off point for reaching higher points, mostly over unpaved routes. From East. The simplest, steadily climbing route begins on the coast, on the west end of Ventimiglia and climbs gently trough Dolceaqua to Pigna. For me this was also the most interesting part on this side. Both of these towns relate to the landscape in such a way, that makes you want to take a closer look. With Pigna, the interesting thing is its relation to Castelvittorio. The former hides in the valley together with a spa. The latter keeps a lookout from above. After that, the ride becomes a long steady climb through forested mountains. The top of the pass can be seen from far below on the left side of the viewshed. When I rode this, the clouds sat on the surrounding peaks and the route looked anything but inviting. But I got over the top before it started pouring. I imagine with virtually jungle like vegetation around here, it must pour quite a bit. On the forested top is the turnoff to Colla Melosa. That route keeps on climbing. From West. (described downwards). The road is practically immersed in a tunnel of dense vegetation. Every once in a while there is tempting glimpse of yet another hill town. But the forest breaks open only once to reveal a view of Loreto before you get down to Molini di Triora. From here on it's possible to head up over many other named and unnamed summits. But the profile chooses to descend as steadily as possible back to the coast. Another jaw dropping view further down is the hilltown of Montalto Ligure, just north of Badalucco. Colle di Langan: Bordhigera > Dolceaqua > Pigna > Colla Langan > Molini di Triora > Badalucco > Taggia > San Remo > sp: 60.0miles with 4320ft of climbing over 5:17hours (VDO MC1.0 m4:12.5.28).